Are you in the market for a bit of mood lighting that features your favorite fairy elements from fantasy? Then look no further than our fairy lamps and lighting. 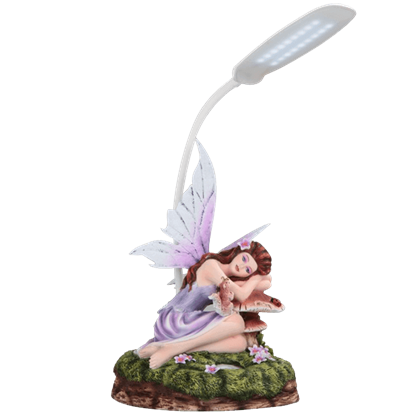 Illuminate your surroundings with the beauty of fairies when you use our fairy lighting options. Some of these items are more traditional lamps than others, featuring large bulbs and a brighter light particularly suited for illuminating a room while also bringing to it a level of fairy and fantasy style that was previously missing. Others are detailed little fairy lights with impressive color and design. The smaller lights create a soft glow that wondrously accents the fairy figurines appearance. Either way, each and every one of the pieces featured here possesses a level of detail and coloration that makes it a great display piece, one that will leave your guests speechless when they see it. This little fairy is enjoying a nice day by reading a book while surrounded by nature. 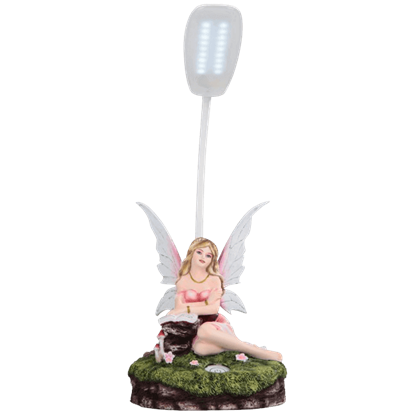 The Pink Fairy Reading Lamp allows you to shine some light on your surroundings while you are reading a book and it makes great home decor. The fairy on this Purple Fairy Reading Lamp must be having an exhausting day. She is shown lying her head down to rest upon a large mushroom that has grown on a patch of rich green grass. Above her is an adjustable reading lamp.